User Summary: Streamlined and revised version of this system. A single 2D6 mechanic for all action resolution. 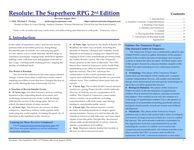 Complete rules for building all types of superhero characters, including detailed listings of over 50 abilities. Rules for superhero scale combat. If you want to pick up a car and throw it at a foe, use energy solidification to project a force field, or crush your opponent in your bare hands, Resolute allows you to do it. A simple bonus system that scales all the way from characters who can barely lift 50 lbs. to those who can lift in excess of 500 tons. An intuitive and fun bonus system where players give each other bonuses for imaginative and detailed uses of powers. An evocative backdrop that provides seeds for ongoing campaigns, and 36 adventure hooks to get you started. Rules for a range of foes you can immediately use, and a fast system to generate any number of adversaries when needed. A superhero scale combat system that replicates superhero smackdown action. Rules for vehicles, devices and gadgets the supers can build and use.